MaxIm DL/CCD Software - A Review by Sky Publishing Corp.
Reprinted with permission from Sky Publishing Corporation. Sky & Telescope, July 1999 issue, pages 70 to 73. If there's ever an award for the most important development in amateur astronomy this century, CCD cameras will certainly be among the semifinalists. These silicon eyes have taken backyard astronomers farther across the cosmos than professional telescopes could go in the days of photography. But CCDs by themselves do not get all the credit, for much of their power comes from the software that manipulates the digital views they produce. Most of the software that comes with amateur CCD cameras includes basic image-processing routines along with the commands for controlling the camera. But for advanced processing techniques, most amateurs have to turn elsewhere. That has changed with the introduction of MaxIm DL by Canadian-based Cyanogen Productions, Inc.
MaxIm DL is a comprehensive image-processing program with an optional module for controlling several popular CCD cameras. It is available on CD-ROM for IBM-compatible computers running Windows 95 or NT 4.0 (and higher). It comes with an attractive, well-illustrated users‰ manual seemingly rare in today‰s world of software. 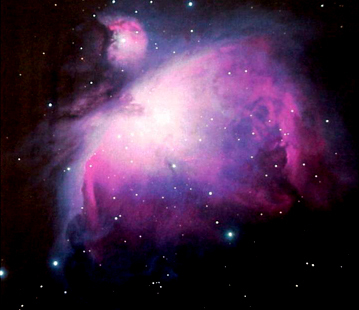 From initial CCD exposures to final color balancing, and all the calibration and image-processing steps in between, this tricolor image of the Orion Nebula was prepared entirely with MaxIm DL. The reviewer used his SBIG ST-8 camera and Astro-Physics 7-inch f/9 refractor for the exposures made automatically through red, green, and blue filters. The optional camera control module available with MaxIm DL operates the built-in autoguider with SBIG‰s ST-7 and ST-8 cameras, or it can control a separate CCD camera as an autoguider while simultaneously running the main imaging camera. One of MaxIm DL‰s camera-control features that immediately caught my eye was the ability to take one image while simultaneously processing another. My beloved CCDOPS for DOS, which is the control program that came with my SBIG ST-8 camera, cannot do this. MaxIm DL includes advanced features for image calibration and processing that far exceed those found in the software supplied with most cameras. Some of these capabilities are especially attractive to those doing tricolor imaging. MaxIm DL‰s optional camera-control module currently supports the complete line of Meade and SBIG cameras (including the PixCel 237 model sold by Celestron) as well as several Starlight Xpress models and Apogee cameras. Motorized filter wheels from Homeyer, Meade, Optec, and SBIG can be controlled, and eventually there will be support for SBIG‰s AO-7 high-speed guider. The program‰s image-acquisition menu is rich with features but has a somewhat steep learning curve. In addition to operating the built-in autoguider of the ST-7 and ST-8 cameras, MaxIm DL can simultaneously run any of the SBIG and PixCel cameras as an autoguider while controlling another camera as an imager. One big advantage of MaxIm DL is that it allows the user to process images while simultaneously controlling a CCD camera taking more pictures. This turns the computer into a useful tool rather than an expensive clock when the camera is making exposures. 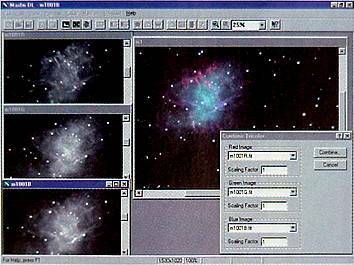 The Expose command lets you specify exposure time, filter selection, and pixel binning, and even define a subsection of the CCD as the active imaging area for the exposure. You can also make automatic multiple-image and tricolor sequences with separate exposure times for each image. When autoguiding sequences, I found it very important to specify a few seconds delay between images. 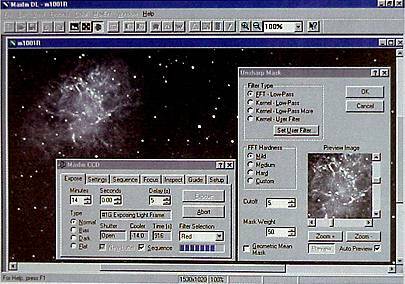 The program interrupts autoguiding while images download from the camera to the computer, giving the guidestar time to drift slightly. The delay lets the autoguider recenter the star before the next exposure begins. The Focus routine has several nice components, including one that allows selecting just a small portion of the CCD the area around a single star, for example to dramatically speed up the download process. Nevertheless, this can prove somewhat frustrating when a short exposure is used in the continuous-update mode. MaxIm DL suspends keyboard and mouse operations during downloads, making it tricky to click the Abort button to end the process. Here too I called upon the exposure-delay feature to help alleviate a potential problem. The focus mode has a neat three-dimensional graph that shows the intensity profile of a star‰s image as well as the value of its brightest pixel. Ideally, both of these peak when the focus is sharpest. There is also an indication of the profile‰s full width at the half-maximum (the FWHM value), which should read a minimum at best focus. As I experimented with these three readouts, I often reverted to the brightest-pixel method for achieving best focus. The Guide functions include an option for viewing an image from the guiding CCD. Unfortunately, this does not operate in the continuous-update mode, which would help when searching for guidestars. There is, however, a nice feature that allows binning pixels on the guiding CCD, thus increasing the sensitivity for faint guidestars. There are extensive calibration options for autoguiding, and they all worked well. They are needed to "teach" the program how the telescope‰s drive responds to corrections issued by the software. After the system is calibrated, you select the desired guidestar in an image by clicking on it. Among MaxIm DL‰s vast image-processing capabilities, I found the image-calibration routines among the most valuable. Image calibration involves subtracting bias and dark frames from a picture and processing it with a flat-field frame. The program will walk you through the calibration setup with an interactive tutorial called a "wizard". Single-bias, dark, and flat-field frames can be used for image calibration or you can combine multiple frames (with either average or median routines) to reduce noise in the processed images. Once the setup is complete, only one click is needed to calibrate any number of images taken under the same conditions. The program has automatic-scaling features that let you use a dark frame made at different temperatures of the CCD or with different exposure times than the image being calibrated This function worked very well even for images from my ST-8‰s antiblooming CCD, which has a nonlinear response under some situations. It allowed me to calibrate images with dark frames that differed in exposure time by a factor of three or differed in temperature by 5Á Celsius. The reviewer found the program‰s routines for combining tricolor images to be especially good, allowing registration of stars to a subpixel level. The view here is of the Crab Nebula, M1. There is another impressive set of tools with the image-combining utilities. They range from manual to fully automatic operations. Files can be registered with subpixel accuracy, unlike many programs that align images by simply translating one image relative to another in whole-pixel increments. Images can also be rotated to match one another by selecting the same pair of widely spaced stars on each image. Frames can be combined by adding pixel values or by using averaging or median routines. MaxIm DL uses the FITS format for images, which is the astronomical standard. But it also supports TIFF, JPEG, and BMP formats in addition to native files from SBIG and Lynxx cameras. FITS files can be 8-, 16-, or 32-bit data as well as IEEE floating point. The software can output files in any of these formats, making it valuable for conversion between file types. One oddity I noted occurs when MaxIm DL opens an image from my ST-8 saved with the CCDOPS software. MaxIm DL does not show the temperature of the CCD when the exposure was made (this information is in the ST-8 file header), thus making it difficult to choose the correct dark frame for image calibration. The MaxIm DL desktop has conventional Windows-format pull-down menus along with an icon-laden toolbar for quick access to many functions. Images are automatically scaled for brightness and contrast when opened. Process-menu functions include options for sizing, filtering, and stretching an image. Selecting an entry from a menu can bring up additional options. For example, the Stretch command opens a dialog box for setting an image‰s contrast and brightness. You can select a stretch that goes from zero (black) to the brightest pixel in the image, auto stretch, or manual adjustments. A preview window opens to show how the selected manipulation changes a small portion of the image in real time, rather than requiring you to wait for the whole image to be processed. The preview window can be scrolled around to show specific parts of the original image and zoomed in or out two times. Logarithmic and gamma scaling are also available. Another variation of the stretching process is called histogram specification, and MaxIm DL offers this with six fixed settings and one that is user adjustable. The program allows each pixel in an image to be processed with any of the four basic math functions. You can also perform these operations using corresponding pixel values in two images. MaxIm DL bristles with a powerful assortment of filtering tools. While I don‰t have room here to explain what all of them do, they include high-pass, low-pass, hot-pixel, dead-pixel, average, median, erosion, dilation, and user-defined routines, all with three kernel sizes. High-pass and low-pass filters using fast-Fourier transforms (FFTs) are available in four strengths. An unsharp mask enhances small details within an image, and the one in MaxIm DL can use either the kernel or FFT low-pass filter in its operation. The most remarkable "filter" included with the program is maximum-entropy deconvolution. This processing tool can reveal detail in galaxies, nebulae, and even planetary images that remains hidden in the original because of blurring, much of it due to poor atmospheric seeing. As powerful as this tool is, it can be frustrating to use because without some trial-and-error experimentation the results are somewhat unpredictable. As with image calibration, a "wizard" holds your hand throughout the setup; people new to the process will find this very handy. It helps to have a fast computer for this process, especially if you are working with large image files. The first computer I tried (a 90-megahertz Pentium with 64 megabytes of RAM) took more than an hour to do a 10-iteration deconvolution of my ST-8 image. A 350 megahertz Pentium II with 128 megabytes of memory accomplishes the same task in only six minutes. MaxIm DL makes the image-sharpening power of maximum-entropy deconvolution available in a simple-to-use format, though some trial and error is often needed to get the best results. 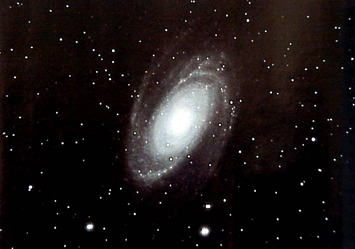 The reviewer‰s picture of the spiral galaxy M82 was sharpened with the process. As mentioned in the accompanying text, the program has a nice feature for subduing the dark "doughnuts" that form around stars in images processed by maximum-entropy deconvolution. Many readers are familiar with the dark "doughnuts" that form around stars in images processed with maximum-entropy deconvolution. MaxIm DL has a tool that copies stars from the original image to the processed one, making the final view more aesthetically pleasing. It works quite well, but it has to be applied by individually clicking each star you want to replace. The software has nice tools for assembling tricolor images automatically, if the individual frames are reasonably well registered at the outset. Marking a reference star and a pivot point on each image lets the software combine the images with subpixel registration. There are provisions for adjusting the background and scaling of each color component. Although these color-balancing tools work, they are not as user-friendly as those in mainstream image-processing programs such as Adobe Photoshop. Any minor frustrations I had with a few of MaxIm DL‰s functions must be viewed in the overall context of a powerful, high quality, and very complete suite of tools that will be useful to most amateurs working with CCD cameras. It is reasonable to expect to spend time learning to use a program that has as many sophisticated features as MaxIm DL offers. Georgia amateur David Hanon is a veteran CCD imager. His review of the SBIG AO-7 high speed guider appears in last November's issue, page 59. Copyright (c) 1999 Sky Publishing Corp.